Males (Bulls): 1.4 - 1.9m, 55 - 170 kg, Females (Cows): 1.2 - 1.7m, 45 - 105 kg. Common seals are not as Common as the Grey Seal. Unlike the grey seal by contrast these tend to be less nosiy and not as colonial not being as sociable or living in oragnised herds.Common seals vary in colour from black, brown, grey or tan, with darker patches. The pattern is unique to each seal. The have head is relatively large with a short body and flippers. Greatest densities found around the Wash and the Norfolk Coast. Male common seals have a shorter life span than females, living up 10 years longer cf 20 - 25 years as opposed to females living up to 30-35 years. Common sealse merge and bask out onto rocky shores, mud flats and sandy beaches. They may also inhabit fresh water. Travel is usually within 20km of the the shore. 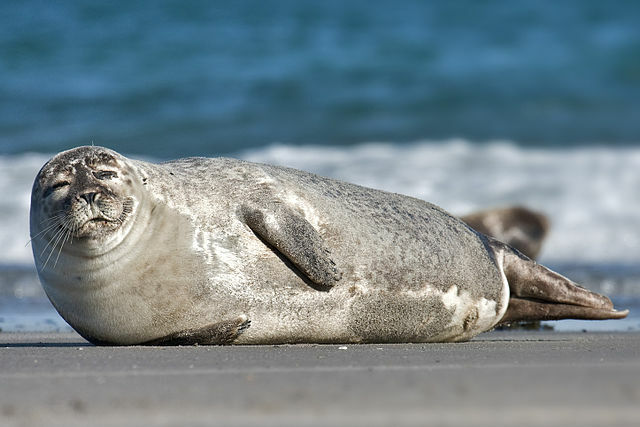 The common seal is a feeder of opportunity hunting fish, molluscs and crustaceans. They make short regular dives, usually to >100m. Mating and Courtship take place underwater , females give birth to a single pup. The pup is born in an advanced state of development, and can crawl and swim within a few hours of birth. Mothers will mate again immediately after weaning.